How can it be reconciled? "I need to find some uplifting fiction." 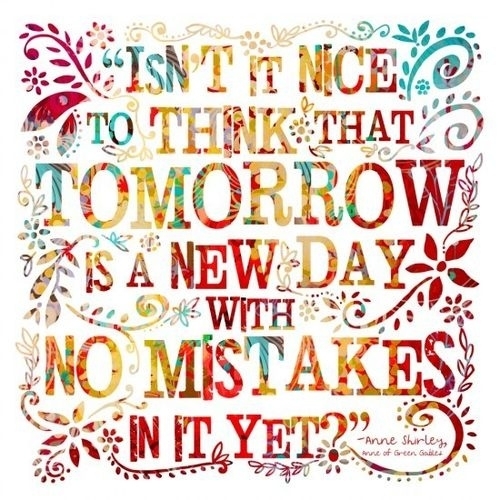 I'd been reading this book every night for a few months with my younger daughter, 10 year old Caroline...and, indeed, I found it to be my very favorite part of my day. Sweet Anne just melted my heart every time. But when Matthew comes to the train station to pick up the orphan boy he is surprised to find a little girl of about eleven years old. Matthew is shocked to find this young girl...and shocked more when the train official says, "I asked her to go into the ladies' waiting room, but she informed me gravely that she preferred to stay outside. "There was more scope for imagination," she said." Right there on p. 15 we meet Anne and we find out an important clue into her heart. It had been a long time since my imagination was summoned, but Anne called to it like some sort of Emergency Broadcast System and it found its way back home. Turns out that Anne's imagination was her defense against a difficult world. When Matthew meets Anne she immediately showers him with all of her thoughts. "Oh it seems so wonderful that I am going to live with you and belong to you. I've never belonged to anybody - not really." That sentence caught in my throat as I said it out loud. I have had the privilege of belonging for my entire life. So many many children ache for it. I'm crushed to consider Anne's plight...even if for a moment. It just makes me feel glad to be alive - it's such an interesting world." She is on the look out for kindred spirits...and she finds them, plenty of them, in some of the most unlikely people, including a crotchety old woman and darling, shy Matthew. 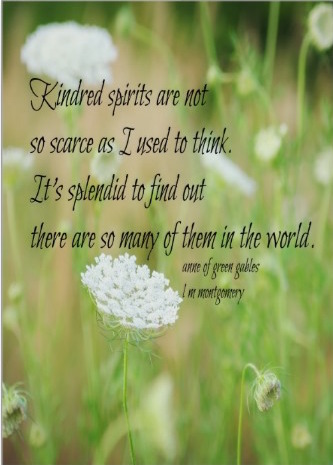 Always be on the look out for a kindred spirit...they are all around. She is stubborn, super smart, over dramatic and hilarious. "What a splendid day! said Anne drawing a long breath, "I pity the people who aren't born yet for missing it. They may have good days, of course, but they can never have this one." But, it was the very last chapter, The Bend in the Road, that sealed my Anne Adoration. Anne has won a scholarship to college. This is a very prestigious prize since at the time very few women go to college. But, as life does, hard things happened. Precious Matthew, her biggest fan and best encourager, passes away in a shocking way. 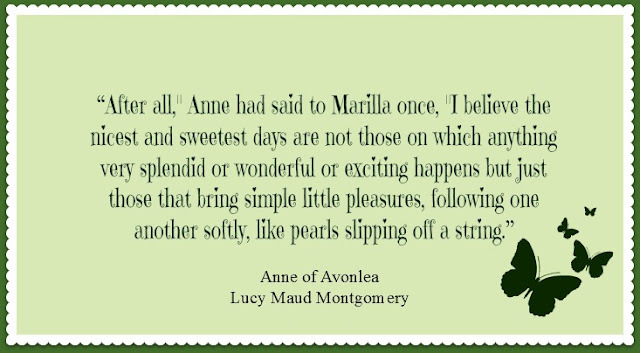 Marilla, Anne's adoptive mother and Matthew's sister, is ailing and looks to be unable to care for Green Gables. Marilla, seeing no other solution, puts Green Gables up for sale. Anne will have none of that. She changes her plans and works to find a way to work as a teacher nearby. She will stay at Green Gables with Marilla. "I shall give my life here my best, and I believe it will give its best to me in return. When I left Queen's my future seemed to stretch out before me like a straight road. I thought I could see along it for many a milestone. Now there's a bend in it. 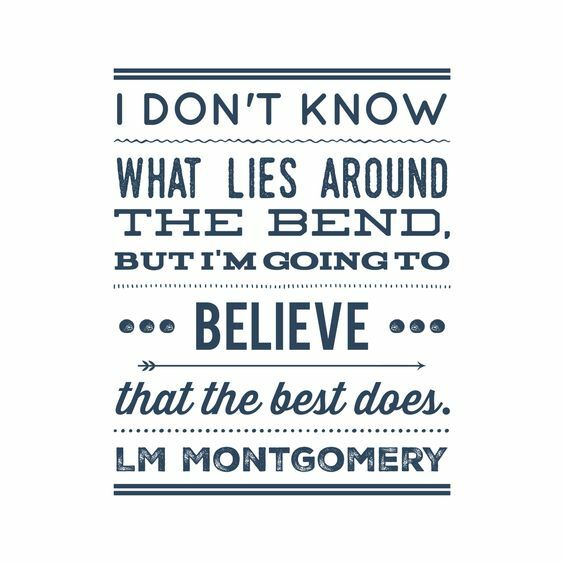 I don't know what lies around the bend, but I'm going to believe that the best does. It has a fascination of its own, that bend, Marilla. ...Anne's horizons had closed in since the night she had sat there after coming home from Queen's but if the path set before her feet was to be narrow she knew that flowers of quiet happiness would blossom along it. The joys of sincere work and worthy aspiration and congenial friendship were to be hers; nothing could rob her of her birthright of fancy or her ideal world of dreams." 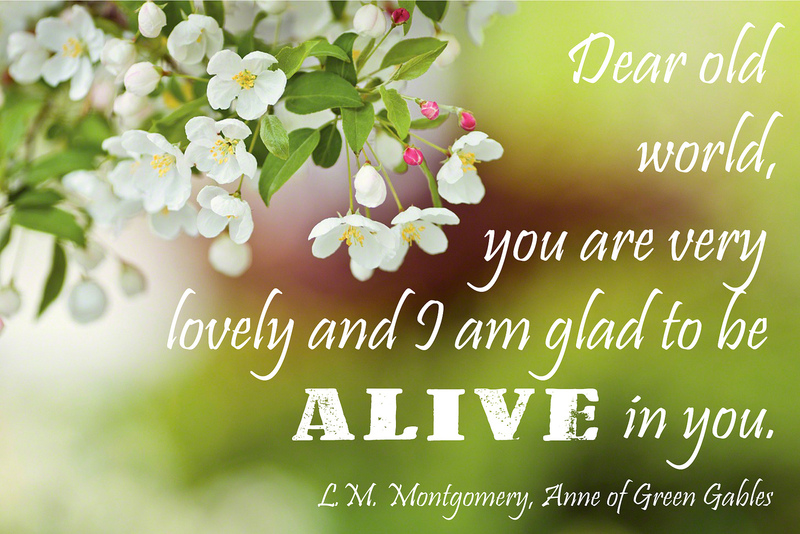 Anne's ability to handle the bend in the road with her one-of-a-kind grace and graciousness were just the lift up my heart needed. Watching her think through the options and adjust so nimbly was a great reminder. We are capable of so much goodness. So...in this world where so much difficulty lies, what books have soothed your soul? For Caroline and me, it's been sweet Anne. Enjoying the pearls in our days. My One Word for 2017...What's Yours? It's 2017...which makes Y2K look kind of cute. For those of you too young to remember, our computers weren't going to be able to handle moving from 1999 to 2000...we needed Y2K kits and preparation. Now, 17 years later, we have different craziness. And a brand new deck of 365 beautiful days. and you have a red carpet of days rolled out just for you. There's this thing going around Twitter asking you to choose a word for the New Year. This word is to serve as a guide, a motivator, a touchstone...a rudder for the year. As a lover of words...this is a nearly impossible task. Last year, I skipped the hype...too overwhelmed at the thought. But, this year, my word found me. If not, read this blog post about this lovely soul right here. In preparing to meet Naomi, I listened to a beautiful interview with her on a podcast called On Being. In it, she reveals a beautiful interaction with a student. Naomi had traveled to Japan for a poetry-teaching trip. She wrote this as a subliminal message. like poems or poets or observations or ways to seamlessly include poetry in your life. But she wanted students to consider it. That's what a poem does." After her trip, Naomi received a letter from one of the students in Yokohama, Japan. 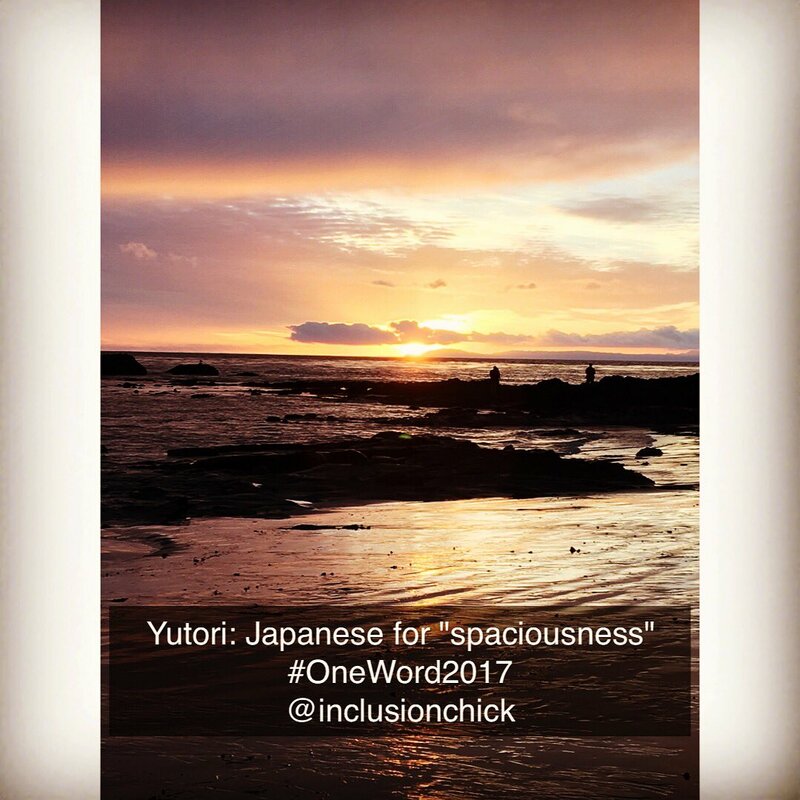 "Here in Japan, we have a concept called Yutori. It's a kind of living with spaciousness. ...and it allows you to see differently." In that minute, Yutori captured me. Like a song that gets stuck in your head, Yutori would not get out. and spaciousness doesn't seem like a very common part of my life. Maybe it's because I often feel distracted when I want to be present. the idea of spaciousness has stuck to my heart like a sticky leaf. I LOVE to dwell in possibility. Soak up possibility like it is a warm bath. So maybe Yutori is just a reflection of that. 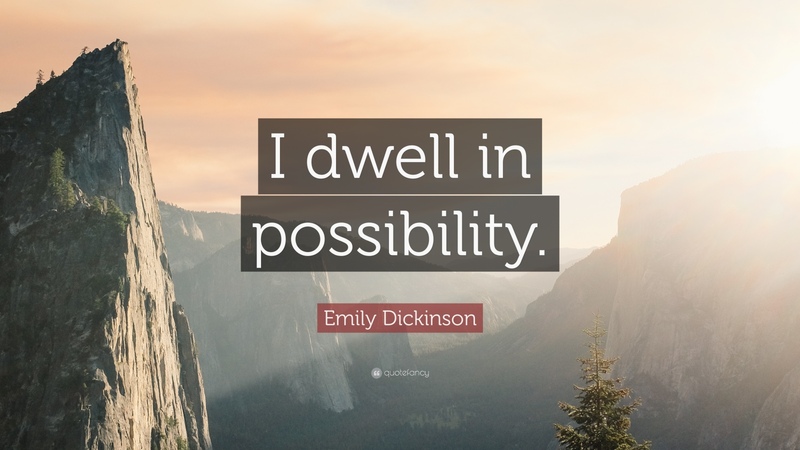 Spaciousness makes room for possibility. All I can tell you is that living with spaciousness, I feel different. ...and that is what I need in 2017. My heart knows it intuitively. So, my gift to you is this precious word. The gift of feeling that anything is possible. test out a few others. Share with me the word that finds you. 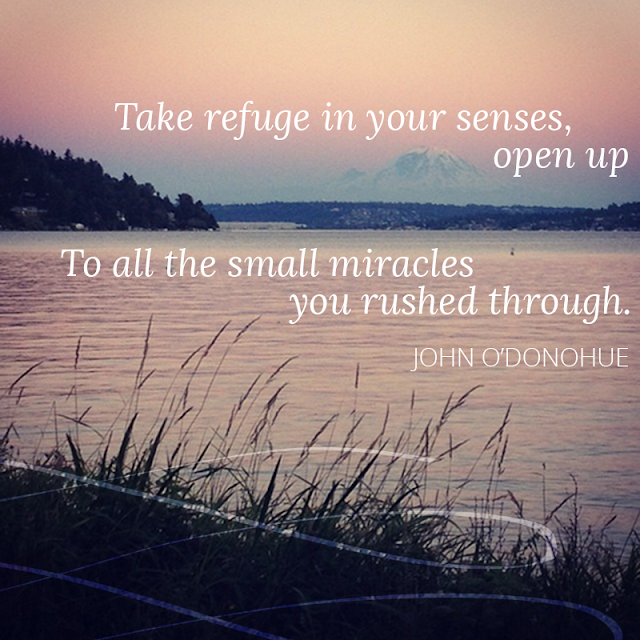 Until then, let your head find some open space and rest. Let your heart find comfort in plenty of room.